More than 40 people chipped in again to make the second edition of the Rocky Mountain Fur Trade Journal a great success. We appreciate all the authors that were willing to submit papers and give this publication a chance. We also owe a debt of gratitude to the peer reviewers who lent us their expertise and credibility, trusting that this new unknown publication would be worthy of their participation. 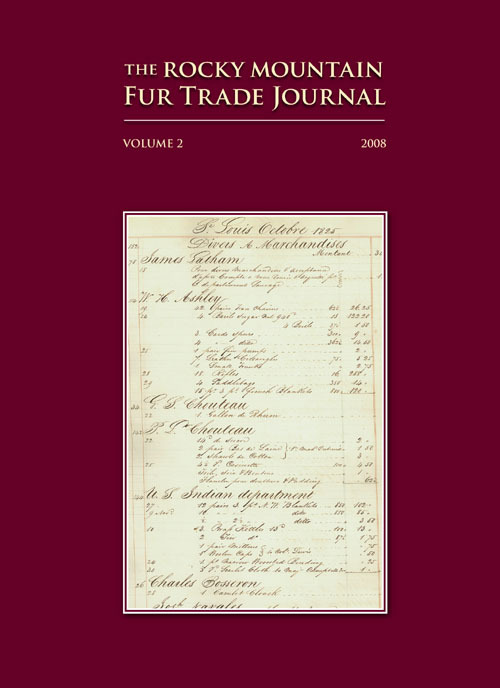 James C. Auld is an author and independent scholar of early nineteenth-century Western American fur trade history. He lives in Seattle, Washington. Auld attended the University of Wyoming and holds a history degree from Northern Illinois University. He has researched and written about the life and times of Jedediah Smith for over fifteen years. For more information visit www.jedsmithlegacy.com. Clay Landry of Whitehall, Montana, is a material culture expert of the fur trade with numerous articles, seminars and presentations to his credit over the last sixteen years. Some of his major topics include the gear, clothing and food of the trapper, trade goods, and trade ledgers of Fort Hall. He is a member of the American Mountain Men. Gary Peterson and his wife Patty have lived and worked in Buffalo, Wyoming, for the past thirty years. Gary is an avid hunter, black powder enthusiast and student of western history. The Big Horn Mountains and Powder River country have provided a rich setting in which to pursue these interests. Gary has written for Muzzleloader Magazine and “We Proceeded On,” the quarterly of the Lewis and Clark Trail Heritage Foundation. Dr. G. Gage Skinner is a cultural anthropologist currently serving as an adjunct professor and lecturer with the Grossmont-Cuyamaca College District, San Diego, California. Dr. Skinner has held a long interest in the fur trade and in the history of the American West. He has worked in private and commercial beekeeping activities in both the United States and Latin America. Terrence Ian Dunn received a B.A. in human geography from the University of Wyoming. He is currently a graduate student in American history at the University of Northern Colorado. Dunn also teaches social studies and Advanced Placement U.S. History at Broomfield High School in Broomfield, Colorado. Dr. Brad Tennant is an assistant professor of history at Presentation College in Aberdeen, South Dakota. He researches, writes, and speaks on various state and regional topics. Tennant serves on the South Dakota State Historical Society, the Brown County Historical Society, and several other national, state, and local historical organizations. Doyle Reid has been involved in historical reenactment for almost thirty years and is a founding member of the Wind River Party of the American Mountain Men. He resides in the Wind River Mountains of Wyoming, living in a log home he built with the help of his wife Debbie, son Walter and daughter Heather. James Auld is an author and independent scholar of early nineteenth century Western American fur trade history. He lives in Seattle, Washington. He attended the University of Wyoming and holds a history degree from Northern Illinois University. Auld has researched and written about the life and times of Jedediah Smith for over fifteen years, concentrating on Smith’s early travels from Ohio to Illinois, and his Pacific Northwest Expedition of 1828. For more information visit www.jedsmithlegacy.com. J. D. (Sam) Drucker is currently an archaeologist for the Bureau of Land Management at the Pinedale Field Office with a Master of Arts in Anthropology from the University of Wyoming. Sam has been involved with historic era excavations at Fort Laramie, Fort Caspar and Miner’s Delight and has located and recorded hundreds of inscriptions at Rattlesnake Pass and Devil’s Gate. O. N. (Ned) Eddins is a Doctor of Veterinary Medicine living in Afton, Wyoming. He has done extensive research on the Plains Indians and mountain men related to the Rocky Mountain fur trade. Ned is the author of the historical novel Mountains of Stone and is the founder of TheFurTrapper.com website. Doug Erickson is College Archivist and head of Special Collections at Lewis & Clark College inPortland, Oregon, where he has worked for fourteen years. He has published two books on Lewis and Clark and teaches courses at Portland State University on the American West, Archives and Special Collections. He has served as a consultant to many agencies, businesses and organizations. Jim Hardee graduated from the University of the Pacific, Stockton, California. He has served as Director of the Fur Trade Research Center since 1998. He is the Museum Factor for the American Mountain Men and is past-President of the Jedediah Smith Society. Jim served as the historical and technical advisor for the History Channel presentation, “Taming the Wild West” and was featured in the program. Gene Hickman has for many years worked as a historical interpreter, focusing on Lewis & Clark and the western fur trade, and working with the Army Corps of Engineers, the National Park Service, the U.S. Forest Service, Montana Fish, Wildlife & Parks and others. He has written numerous articles related to the western fur trade, Lewis & Clark, and Indian sign language. He also authored, through an NPS grant, a manual for interpreting Lewis & Clark. Gene is a Hivaranno in the American Mountain Men and currently serves as the Brigade Booshway for Montana and North Dakota. Dean Rudy, a student of western history, is a member of the American Mountain Men, and the creator of the “Mountain Men and the Fur Trade” website (www.mtmen.org). He has degrees from Cornell University and the University of Utah and currently lives in Park City, Utah. Brad Tennant is an assistant professor of history at Presentation College in Aberdeen, South Dakota. He researches, writes, and speaks on various state and regional topics. Tennant serves on the South Dakota State Historical Society, the Brown County Historical Society, and several other national, state, and local historical organizations. David Vlcek has served as an archaeologist for the Bureau of Land Management in Pinedale, Wyoming, for more than twenty-six years. He has presented numerous papers on western Wyoming’s archaeology, particularly prehistoric settlement patterns in the upper Green River basin, Native American stone circle and rock art sites, reports on Fort Bonneville and other area fur trade sites, the Lander Trail, and much more. Ken Zontek, PhD, teaches history at Yakima Valley Community College in Yakima, Washington and serves as an adjunct professor at nearby Heritage University in Toppenish, Washington on the Yakama Reservation. University of Nebraska Press released his monograph, Buffalo Nation: The American Indian Effort to Restore the Bison, in March 2007. He considers himself both an environmental historian and ethno-historian focused on the North American West.